Baumann Consulting provided LEED services, energy modeling, and measurement and verification (M&V) for TaunusTurm, a development project in Frankfurt’s banking district, which achieved its ambitious certification goal of LEED Platinum. TaunusTurm is a combination of a 40-story office tower and a 19-story residential tower located in the heart of the Frankfurt banking district. Easy to reach by private or public transport, TaunusTurm will provide access to the city’s abundant shopping, dining, and entertainment options. 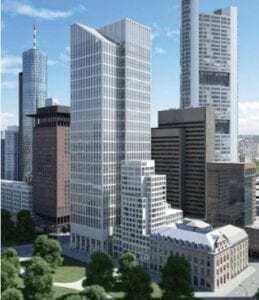 [:de]TaunusTurm is a combination of a 40-story office tower and a 19-story residential tower located in the heart of the Frankfurt banking district. Easy to reach by private or public transport, TaunusTurm will provide access to the city’s abundant shopping, dining, and entertainment options.